AS an entrepreneur you are a skilled leader. You provide the context in which you develop other leaders in your organization. You don’t mandate cost cutting. You make them want to shed costs. You set the example. This context is commonly known as culture. As a leader one real significant thing you do, according to author and organizational psychologist Edgar Schein, is to create and manage culture and that the unique talent of leaders is their ability to understand and work with culture. He said that if one wishes to distinguish leadership from management or administration, one can argue that leaders create and change cultures, while managers and administrators live within them. Mandating cost-cutting means that you are trying hard to live within the prevailing situation, reacting to it rather defensively and offending many of your employees. For example, your knee-jerk reaction to financial difficulties is to cut people cost. But laying off people will cost you money and the loyalty and motivation of the surviving employees. Chrysler emerged triumphant and walked out of bankruptcy soon enough under the brilliant and bold leadership of Mr. Iacocca. He set the example. He influenced the corporate culture by way of his behaviors. He did not just tell his employees to cut costs, he showed the way. He gave them an option. Instead of threatening them, he inspired them to accept salary cut in order to save their jobs and the company. Mr. Iacocca created a culture of voluntarism or “bayanihan” in Chrysler without much talk. His $1 salary sent a very strong and resounding message throughout the Chrysler organization, among their creditors and other stakeholders. How do you create a positive culture? One is by modeling the behaviors that you want your employees to emulate and by eliminating behaviors that do not work. What do you represent? What do you want to represent? Oooops, I am not urging you to put on a certain persona that you are not. You must work toward developing that image you want to represent. When you say that your company is sailing through rough times, yet you continue to feed your luxurious taste and expensive lifestyle, you are creating dissonance in the minds and hearts of your employees. What will they believe? Your actions. It does not matter that it is your personal money that you are spending. Another way you create and manage a positive culture is by sticking to your words. As soon as Chrysler was declared out of bankruptcy, as promised, Mr. Iacocca restored the workers’ full pay immediately. When your action matches your words, that’s integrity (Kailangan pa bang i-memorize ‘yan?). You don’t just teach your employees to think, feel and perceive cutting costs. Rather your articulation of your very own strong ideas about the subject and how to do it does the work. While your nonverbal language sends very strong signals, still talk is cheap and crucial. Communicate, communicate, communicate. A reminder here is that your sincerity comes from doing and saying what you feel and strongly believe in while your honesty can be perceived from your doing and saying what you think and know for sure. As an entrepreneur and a leader, you have lots of opportunities to embed your preferences, beliefs, values and philosophy on cost effectiveness in the various aspects of your business. Don’t just wait for tough times to pass. As Mr. Iacocca used to say, “The trick is to make sure you don’t die waiting for prosperity to come. Wow, Philippines! Ganda ng Pilipinas, Galing ng Pilipino is the theme of the campaign of our Department of Tourism to lure fellow Filipinos to become tourists in our beautiful country. I was impressed with the roadshow they did in Davao City last Friday. Producer Boyet Guerrero brought to the appreciative Davaoeño crowd the talents of the swinging JYC and the Jukebox Band, the inimitable folksinger Florante and the statuesque Bb. 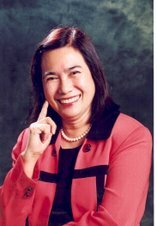 Pilipinas Nina Ricci Alagao. Of course, local talents Music Authority, A to Zinc Band, Maharlika Dancers and DJ Joey were not to be outdone. The very talented John Lesaca treated the audience to his beautiful violin music. Except for snow, we have all the natural attractions that you could find in other countries. And more at very affordable prices and no need for passport and visa. DOT provides easy-on-the-pocket packages for your whole family and friends. No, I did not lose my luggage in Davao. Thank God for friends like painter and sculptor Vic Secuya and businessman Jess Dy who toured me around the City in their sleek cars. I also enjoyed doing my one-hour brisk walking exercise along tree-lined Dacudao Avenue. Air smelled good and fresh. Davao is a wonderful vacation destination or even a permanent residence place. My friends Jojo and Ruth Agullo of Landbank of the Philippines have decided to settle there. They said that even with their joint salary, they will be unable to experience in Manila the comfortable life they are now enjoying in Davao. They have their own house, a wide yard for their child to romp around and, pray for it, their own car this year away from the hectic pace and rat race of modern cities.